The new iHawk app is a compact, wireless, Bluetooth-enabled device and software package capable of turning any CAN vehicle into a custom gauge displaying, data-logging highway star via iPhone, iPad or iPod Touch. CAN vehicles are those including a vehicle bus that interconnects components inside the vehicle with protocols like the Controller Area Network (CAN), Local Interconnect Network (LIN) and others. All vehicles built since 2008 have been required by law to be CAN compatible. Numerous vehicles from 2005 and on including Audi, BMW, Chrysler, Ford, GM, Jaguar, Land Rover, Mazda, Mercedes, Mitsubishi, Subaru, Toyota, Volvo and VW also have this capability in certain models and years. The new iHawk package consists of a small Bluetooth LINQ module that plugs into the port under the dash and an app downloaded from iTunes. Installation is reportedly just like plugging in a flash drive and requires no tools. Then you can easily flick through multiple dashboards, gauge screens and other diagnostic choices to customize your instrumentation displays. 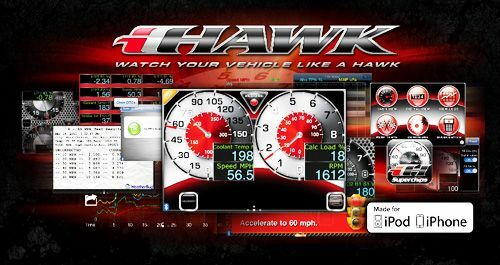 You can configure settings to measure vehicle acceleration (with a web connection), reset display parameters, send automatic alerts, log any kind of gauge data using custom parameters, select analog or digital styles, record zero to 60 and quarter-mile times with real time Dashboard and One Touch storage of screen images and data. The Superchips iHawk is compatible on many vehicles from 2007 and up, as well as many Can vehicles built in prior years. iHawk uses the iMiken AccuPerformance system to accumulate vehicle, weather and performance data, integrating the information to provide precise results and analysis. It's the equivalent of a portable dynometer, digital gauge kit, trouble code scanner, data logger and quarter-mile drag strip timer, all neatly accessible via an iPhone, iPad or iPod touch. To keep up with the company sign up for their newsletter. To view a fairly concise list of CAN vehicles, click here.